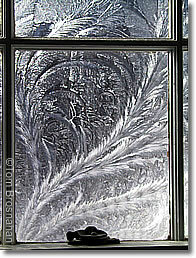 "Frost feathers" are common in northern Vermont during the cold New England winters, but not as common in Concord MA. I awoke on Valentine's Day (February 14th) to find this wondrous work of art on one of my windows. It was early in the morning on a bitter-cold day. 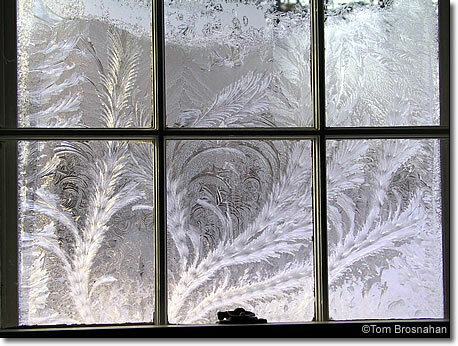 Moisture from within the house froze and crystallized on the inside of the storm (outer) window in these beautiful patterns. Few times have I seen one as delicate as this. After an hour, the bright morning sun melted it, and it was gone.